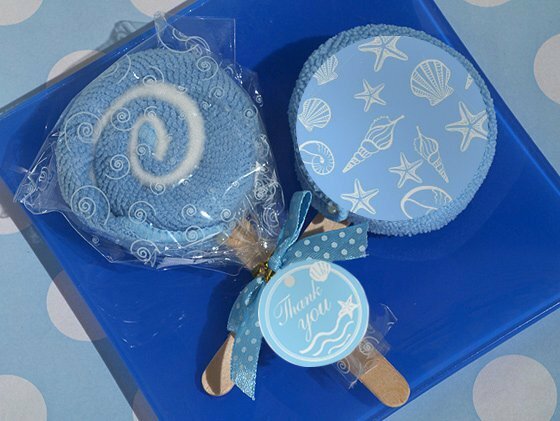 SHARE You'll have your guests thinking about the ocean and warm weather fast with these sweet lollipop towel favors! Rolled to resemble a blue swirl lollipop, the 100% cotton hand towel is affixed to a round seashell themed sticker and attached to a stick. The top portion of the favor is covered in a clear cellophane bag and tied with a blue satin ribbon with a matching "Thank You" tag. The hand towel measures approximately 8" x 8".